She refers to Captain Zinnerman as "Master," which irritates him, and loyally carries out his orders. Marida also sees herself in the ideal of misconceived notion that Newtype are to serve as weapons. Marida also seems to have a deep loathing hatred for the concept of the Gundam, as when one appears her objective changes to completely and thoroughly annihilating it. 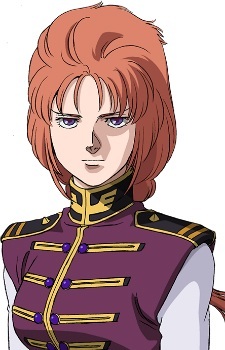 After meeting with Banagher Links, and particularly after her recovery from the Banshee's cockpit, Marida's personality begins to change, and a hitherto unseen kindness begins to become apparent. Marida is a capable pilot and artificial Cyber Newtype. She is also proficient in military martial arts. When piloting the Kshatriya Marida primarily utilizes the funnels, usually about 18 at any one time, to overwhelm the enemy with multi-directional ranged attacks. This tactic tends to quickly eliminate weaker enemies while restricting the movement of stronger enemies. Should the funnels prove to not be enough Marida will then close in and use beam sabers. She tends to hold the mega particle cannons in reserve. Originally known as "Ple Twelve," she is actually a clone of Elpeo Ple. She was awakened by Glemy Toto and fought with her sisters during the First Neo-Zeon War. After the fight with Chara Soon in U.C.0089.1.17, one of the clones survived and was retrieved by an MS pod. She was then sold to prostitution; there on she worked as a prostitute. Before being protected by Zaberoa, she experienced countless pregnancies and abortions and was scarred by the abuse of her customers. During an examination on board Nahel Argama when she was captured, it was ascertained that she cannot bear children anymore.